Decline of immunity has been considered a major cause of increased incidence of disease in old age. 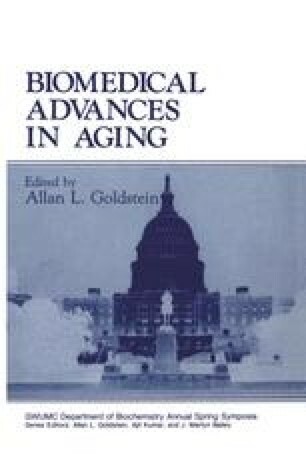 In order to establish approaches to treatment that would lead to augmentation of immunological vigor, attempts were made to determine the mechanisms underlying the age- related changes in the immune system. Since reduced immune responses are most pronounced in the T-cell compartment (reviewed by Makinodan et al., 1987), it has been causally related to thymic involution. Consequently, studies on treatment with thymic hormones were carried out, showing that certain immunological responses of peripheral lymphoid cells can be enhanced (Friedman et al., 1974; Weksler et al., 1978; Grinblat et al., 1983; Frasca et al., 1985). In addition, decreased function of thymic microenvironment in inducing T-cell development was reported (Hirokawa and Sado, 1978; Hirokawa et al., 1982). It was thus postulated that developmental failures may be, at least in part, the basis of immunosenescence. Indications that immature T cells become abundant in aging were subsequently reported (Jensen et al., 1986), lending further support to this idea. In this respect, the increase in levels of PNA + cells noted in aging mouse spleen (Globerson et al., 1981) seemed to conform to this notion. However, the precise nature of developmental failures has hardly been established. The main difficulty has been the fact that T-cell development is a complex stepwise process. It involves migration of stem cells from lymphohematopoietic tissues into the thymus, in which differentiation into various T-cell subsets occurs (Scollay et al., 1984), and T-cell receptor genes are rearranged (Snodgrass et al., 1985). Furthermore, although generation of T cells starts in early ontogeny and continues throughout the life span, the tissue origin of cells that seed the thymus changes with aging, in addition to the aging processes in the thymus itself.